This blog post first appeared in The Scottish Planner (April 2016 edition). 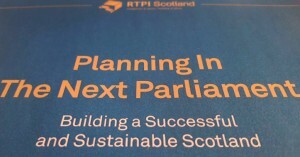 Why is RTPI Scotland spending so much effort on the Scottish Government’s Review of the Scottish Planning System and trying to influence Planning in the Next Parliament? At one level, the answer is obvious: to influence politicians, government, other professions and the media. And because political agendas and the changing world don’t stand still (think changing political agendas), neither can planning. If the RTPI and the planning profession doesn’t evolve, we will get left behind. I sensed that happen when Community Planning was introduced by the government in 2003. Too many of us failed to recognise that Community Planning would become the new vehicle for making decisions about public sector investment and service delivery – key decisions about urban management that, in earlier decades, would have been made through the mechanism of the planning system. Thirteen years on, Community Planning is becoming ever more important as the means by which key public sector decisions are taken about the future of places. If we absent ourselves from the table again, we risk being further marginalised from the big discussions about how places are managed in the future – which is surely the essence of what planning is about. That’s why the RTPI Scotland manifesto and our response to the Review of Planning carry such strong messages about integrating land use planning with Community Planning, and about the vital role of planners and planning in delivering development, community empowerment and placemaking. It’s critical for the future of the profession that we spell out to policymakers how planning can be a force for good. You only need to look at how the profession has suffered south of the border over the last six years to see what a less positive future might hold for us. But my motivation isn’t simply about protecting our own professional interests. Planners have a vital role in delivering better communities, better places and a better Scotland. Using the RTPI Scotland manifesto and Review of Planning response as our starting points, RTPI Scotland staff and volunteers are busy explaining planning’s positive contributions to politicians, Review panel members, civil servants and other professions. We can draw on examples of good planning from up and down the country that demonstrate our unique strategic ability to balance different interests over the long term, focus on creating better places, and deliver positive change on the ground. But we could all do better – me included. Creating better places, better communities and a better Scotland must involve every single RTPI Scotland member if we are to deliver the promise that’s contained in the manifesto and Review response. What can I do, you might ask? 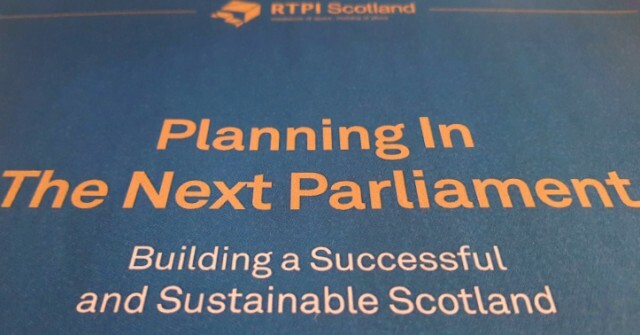 Well, look again at what RTPI Scotland response to the Review of Planning and our Manifesto for Planning in the Next Parliament. They are short and won’t take you long to read. Those two key documents are much more than positioning statements to others. They are our commitment to ourselves, of what we as a profession will strive for in the coming years. At first glance, you might think that the RTPI Scotland manifesto and Review response are simply asking for support from others. But read them through another lens, and you’ll work out that there are many little things that each of us could do, every day, to make planning more of a force for good – without waiting for others to give us more resources or authority.